It’s been about a year since the Olympics came to London. So my little personal Olympics story has taken a while to get written! I love cycling, and have done for years. I was still feeling bitter that whilst I was away in Germany my family went to see the end of a Tour de France stage, so I thought I should get down to Hampton Court and try to see some cycling for myself. It was a bit of an arduous journey, involving a lot of running for last minute trains and hopping about in queues trying to buy tickets in time. I had never taken the over ground in London before. It. Is. So. Slow. Everyone in my carriage was heading to the cycling though, so the conversations between fans were interesting. Road cycling is one of those great sports that’s truly down to earth in terms of its fans. You can’t stick road cycling in a stadium or in a closed off arena, it takes place on regular roads and anyone can go and see it. It was the same with the Olympic time trials, with the route spread out in a figure of 8 starting at Hampton Court Palace. You had to have tickets to get into the Hampton Court start area, where you could also see the medals ceremony, but the rest of the race was open to anyone. There were all sorts of people watching; families with kids, people with their own bikes, groups of students, elderly couples on fold out chairs, all with different flags to wave. I slipped into a small space between two couples in the perfect spot; down the road to my right was a sweeping bend, which turned into along flat stretch, then down the road to the left there was a sharp bend taking the cyclists out of sight. My phone was dying and I didn’t have my camera so I only have one grainy shot of what it all looked like, but it caught some of the atmosphere in the air. Once the event had started there was a warning whistle that there was a cyclist approaching, and volunteers closed off the crossings. A few seconds later a motorcycle would tear round the corner with the cyclist swooping not far behind, followed by the team car with extra bikes on their roof in case of emergency. Each car had a small plaque at the front to say which country and cyclist it was, which made it accessible to those who may not know the team cycling colours. People with smartphones were also helping, shouting down the line to let everyone know who was expected next. This was when I started to come over all fangirly. I soon gave up being embarrassed about being there by myself and gave into it all. I cheered on some of my favourite cyclists like Ryder Hesjedal, Tony Martin, Louis Leon Sanchez, Alexander Vinokurov, Jakob Fuglsang, Dennis Menchov, Sylvian Chavanel, Edvald Boasson Hagen (yep, told you I like cycling). They all streaked past in a blur with the same pained grimace, legs pumping and wheels whirring. And then the last three riders came past, two of whom have been longstanding favourites of mine. Chris Froome the British cyclist obviously got a big cheer. When Bradley Wiggins came into view the entire road exploded into cheers and screams of ‘Go on Bradley’ ‘Go on Wiggo!’ And yes, I was amongst them, shouting and waving and even jumping up and down a bit. 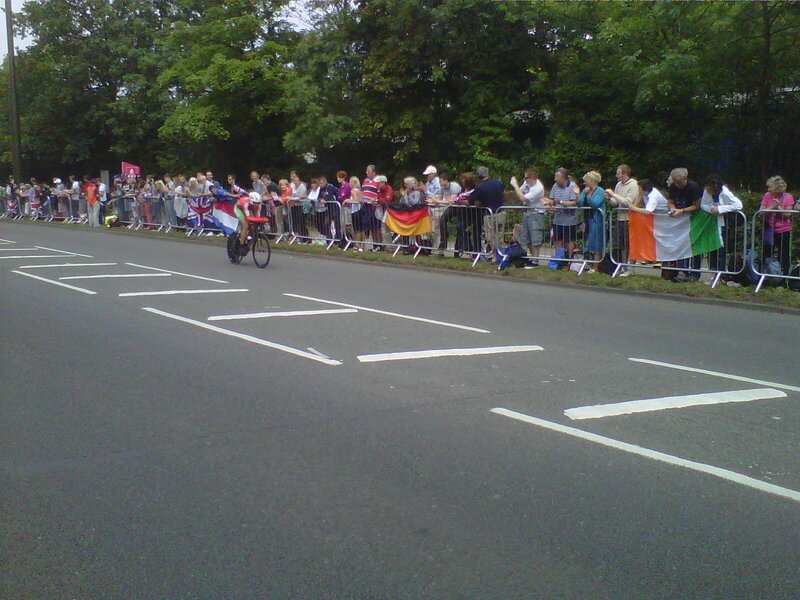 Then when the final cyclist Fabian Cancellera whizzed past in his Swiss flag helmet, that was it. All over. I did the two hour journey back to my friend’s flat with a grin on my face. I didn’t really care who had won, I was just happy that I had made the effort to go down, that I had seen cyclists in the flesh that I had watched on television for years, and got to shout out their names and encouragement as they sped past a hair’s breadth away from me.